I know it’s been a while, but I finally gathered enough empties for a proper post. I feel like it’s taking me longer and longer to finish products these days, which makes no sense, because this year I’ve been testing a lot less and using more of what I have. Still, even though I don’t have a huge pile to show you today, I am very excited to share my final thoughts. The products are mostly skincare, with one single body wash to represent the bath & body category. Without further ado, here’s what I finished in the last few weeks! 1 // L’Oreal Micellar Cleansing Water Complete Cleanser* ($9.99) – This bi-phase liquid makeup remover is part oil and part regular micellar water, so it works as well as you’d imagine. The formula reminds me of the cult classic Lancome Bi-Facil, except it’s cheaper and you get a lot more product. Just so you know, this is probably one of my favorite L’Oreal skincare products. It completely removes my eye makeup, even long-lasting eyeliners and waterproof mascara, so I plan to get more at some point. 2 // Neostrata Tri-Therapy Lifting Serum* ($100) – This serum saved my skin during the winter months, despite the stress, lack of sleep, and terrible nutrition. The bottle lasted a long time, because I only used a few drops at a time, which was more than enough to get my skin plump, hydrated, and glowing. Repurchase? Yes, if I find a good sale. 3 // The Ordinary Alpha Arbutin 2% + HA ($8.90) – At this point I’ve used up 3 bottles of this solution, and even though it seems to be effective at fading freckles and hyperpigmentation, the results just take too long to show. For instance, I started noticing a visible change in the appearance of my freckles when I was about 2 bottles in, after months and months of consistent daily use. I know that for some skin concerns the improvements are very slow and gradual, but I used products before that worked much faster. I guess I’ll just use something else from now on. 4 // LJH Tea Tree 90 Essence ($20.90) – I lost count how many bottles of this stuff I’ve used up to date, it may be 7 or 8? This clear serum was one of the products that helped me beat adult acne and calm the skin, and I stocked up on enough of these to last me through a zombie apocalypse. Just so you know, I have one last bottle left that I just cracked open after finishing this one, and after that one is empty I think I will venture out to try something else. All in all, it’s a wonderful and soothing essence and it helped a lot with my breakouts back in the day. 5 // Tatcha Luminous Deep Hydration Firming Eye Serum* ($85) – Everything about Tatcha skincare is so elegant: the packaging, the textures, the scents. This eye serum is no exception. The product is essentially designed to offer a boost of hydration to the skin without the greasy and sticky feeling commonly associated with moisturizing eye creams. This particular formulation is ideal for hot summer days when your skin is evaporating moisture like crazy, but at the same time you don’t feel like using heavyweight products to prevent that from happening. It also sits wonderfully under makeup, and hasn’t flaked on me yet. The cooling ceramic tip feels very nice, but I much prefer using the small side of my jade roller instead. Repurchase? Yes, if there’s a good sale. 6 // Glo Skin Beauty Solar Shade Mineral Sunscreen SPF50* ($40) – I finally finished this sunscreen, and it sure lasted me a long time despite the bottle being so small. The brand has new packaging now, but the product inside features the same great formula that works wonderfully to protect the skin against the damaging UV rays. This is a physical sunblock with Titanium Dioxide and Zinc Oxide, and it doesn’t contain fragrance and dyes. I recommended it to my aunt who is allergic to chemical sunscreens and who has very sensitive skin in general, and now it’s the only sunscreen she ever uses. It’s pricey, but if your skin is super finicky and can’t tolerate most things, give it a try! Repurchase? Not yet, I have a lot of sunscreens to go through still. 7 // Susan Ciminelli 1-2-3 Glow Professional Home Treatment Kit* ($39.99) – I was a bit skeptical that a kit like this could replicate the effect of going to a SPA for a proper facial, but I must say, no mask ever gave me these results. In 30 minutes my skin transformed. It wasn’t bad before, but after completing all three steps it looked brighter, healthier, and thoroughly hydrated. 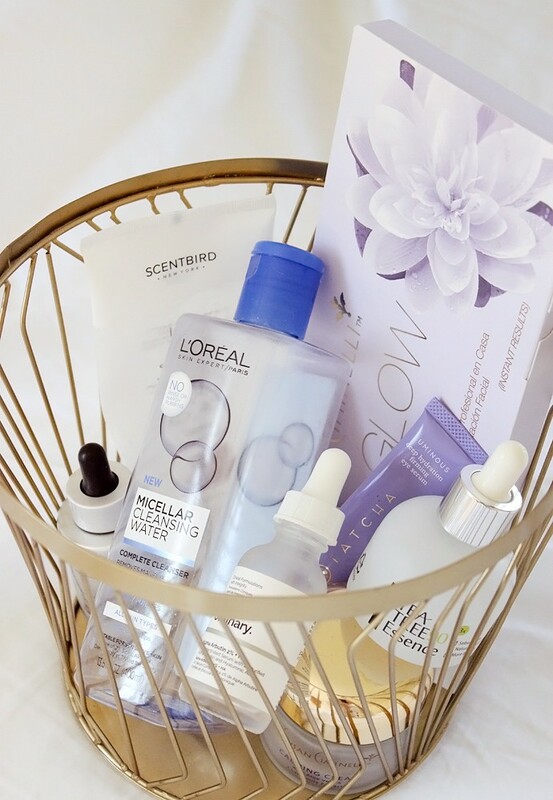 For a single use product this system is a bit pricey, but if you need a bridal or prom facial on a budget, this will work like magic. Repurchase? I think I might for a special event. 8 // Susan Ciminelli Calming Cream* ($125) – I don’t know if there is an equivalent to licking your plate when it comes to finishing your favorite skincare products, but that’s pretty much what happened here. I made sure to scrape every inch off those sides, because this moisturizer is absolutely delightful. It’s one of the few products I can use when my skin is irritated [from a peel done wrong, allergies, you name it], and I just love how it can calm down the redness overnight. After experiencing several of Susan’s products, I am now hoping to schedule a treatment at her NYC SPA some day. Repurchase? I would but I think it was discontinued. 9 // Scentbird Earl Grey & Blackberry Foaming Shower Cream ($14.95) – I’ve been subscribed to Scentbird for the past couple of years, because I love the ability to try different perfumes every month. They recently released a collection of lip balms, hand creams, body washes. body scrubs, and scented candles, and added the option to add those products to your monthly delivery instead of perfume. I decided to try a few things, and unfortunately so far I am not liking any of them. I finished this body wash a few days ago, and I won’t be scheduling another. I love that it creates very fluffy, luscious foam that feels like whipped cream, and the fragrance is just wonderful. However, it has sky high pH, which leaves my skin bone dry and flaky after every shower. Why did I end up using the entire tube? Your guess is as good as mine, lol. What products have you emptied recently? 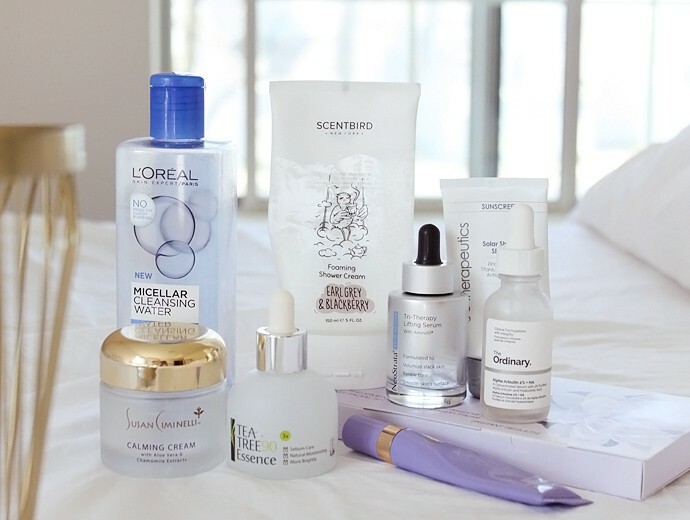 How many beauty products do you typically finish every month? Let me know in the comments below! This post features PR samples and products purchased by Glamorable, and may contain affiliate or referral links. For more details about my product review policy, copyright, and information about affiliate links, please refer to Disclosures & Content Use page.